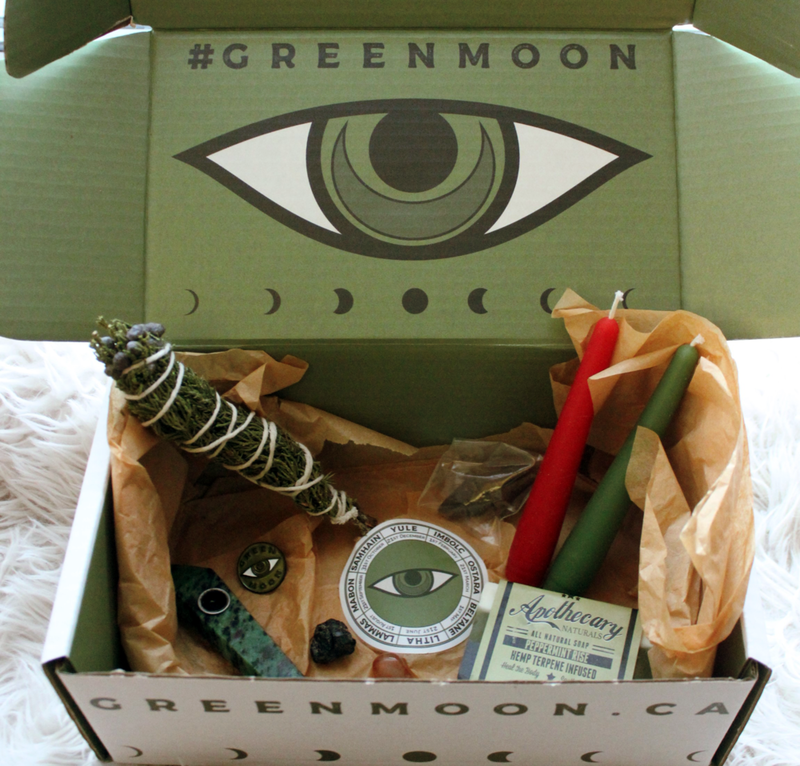 Recently we became aware of a new subscription box service for cannabis lovers and since we love both cannabis and subscription boxes we were intrigued, particularly when we discovered the theme of this box: Witchcraft. The Green Moon Apothecary “is a women-run and founded green wellness business that strives to help guide you to integrate legal cannabis products into your spiritual practices and development.” The women- led green wellness company promises to help guide you to integrate legal cannabis products into your spiritual practices and development. The two founders, Vanessa and Amanda have fascinating personal stories - see the company’s about page - and are clearly passionate about what they do and sharing their beliefs. We love anything that promotes selfcare, cannabis use, spirituality and joy and these ladies tick all the boxes. Sign us up now! Connect with Green Moon Apothecary on Instagram or Twitter or Facebook. How did you get involved in the cannabis industry? Our cannabis industry journey began when Amanda and I realized, as witchy women navigating this newly legalized world of cannabis, now is the time to shape and mold it to our wants and needs by putting our intentions out there and then taking action in our own lives. We had been speaking to others about ritual uses of cannabis and ways to celebrate the spirit of the plant, but we weren’t seeing a lot of it that was accessible to the average person, or to new users. We wanted to find a way to help people that may be curious about using it in their spiritual practices get their feet wet and also to help people with more experience consuming cannabis or practicing magick to find amazing products made by smaller businesses that are getting a chance to shine now that cannabis is legal in Canada. We came up with the idea for a subscription box series that would add a self-care and spiritual lens to the consumption experience. There are many ways of being a witch, including doing actions that recognise what will make you happy and feel good. Why not bring cannabis into these actions? We offer carefully curated items that help you integrate green witchcraft into your self-care practices, and indulge in holistic wellness products with a cannabis-infused twist. Our boxes include items like handmade spell candles, hemp terpene infused soap, crystal gemstone pipes, and custom stash jars. We always include suggestions on how you can use each item in our blog, and even though we don’t sell cannabis yet, we give you our suggestion on which strain supports the intent of the box. Our Sabbat Boxes are sent out eight times a year, to correspond with the points on the Wheel of the Year. We send a box for the winter and summer solstices, the spring and fall equinoxes, and the four cross-quarter days that fall between them. For us, being a witch is all about practicing self-love and empowerment and our mission reflects this. We provide discovery, delight and guidance as you explore avenues of self-care, spirituality and cannabis. What time does your day typically start and what does a normal day look like to you? No two days are the same! We celebrate cycles and perform rituals, but we’re also modern women living in Toronto. Amanda wakes up earlier, and has usually had a chance to meditate and enjoy a CBD-infused coffee before we coordinate the day’s events by chatting online. We come up with our weekly schedule, discuss any emails or inquiries from our circle or curious members of the public. After that, we could be working on anything! Writing and researching blog posts, sourcing products for the next box, connecting with the community online or in person, or packing and shipping orders, just to name a few! What is your vision for your company going forward? The smokable part of the cannabis plant is female, and when growing the plant you must elevate the female in order to be successful. That is exactly what we want to do with Green Moon Apothecary. We want to grow, grow, grow and successfully create a space for people to explore how to integrate cannabis into their self-care and/or spiritual practices. We are excited to show people that whether you enjoy cannabis recreationally, sporadically, or spiritually, there is a community of others out there ready to elevate and support you in your wellness journey. We get a lot of messages from people in the USA that are interested in what we're doing and would love to build an offering for them in 2019! What would an ideal post prohibition society look like to you? Using cannabis is as normal as doing yoga or meditation and we would love to see an unprejudiced, open-minded society when it comes to cannabis. You don’t have to be a user to appreciate its many benefits, whether holistic, medical, recreational or spiritual. We’ve already had a few speed bumps on this journey due to the stigma of cannabis that is still prevalent in our society, not to mention the stigmas surrounding witchcraft! We’ve had ecommerce sites refuse our business, or have been denied access to website add-ons because we sell what they consider “drug paraphenalia” … and on top of that, others disapprove because we “dabble in the occult”! What are some solutions you've found? Creating relationships within the industry has definitely helped. Some other vendors or industry friends have jumped through these hoops first and are more than happy to give us advice. Staying on top of the latest cannabis community news and doing our due diligence and research also helps us navigate this new world. Also, smoking a joint and doing some spell work to manifest success and happiness always helps! What is one thing you wish everyone knew about cannabis? Just one?! A very hard thing to do! We would love for people to understand that cannabis isn’t a new fad that has come with legalization, but that it has had a rich history, including a history in spiritual use. It is listed as one of the five holy plants in the Atharvaveda, which is a sacred text of Hinduism, and was used by ancient societies such as the Scythians, the ancient Chinese, and the Persians. Winston Churchill once said, “The farther back you can look, the farther forward you are likely to see.” The more you understand the history of cannabis the better you can envision the future of what cannabis can be. What is one thing you wish everyone knew about your product or service? That anyone, regardless of their spiritual beliefs, can enjoy celebrating the Sabbats. They are a celebration of the season and a communion with nature…and one of the best parts of nature is the cannabis plant! What is your favorite way to consume cannabis? A bong is a great way to symbolize the four elements with water inside, lighting the cannabis for fire, the herb for the earth and smoke for air. Edibles are amazing for meditation and for thinning the veil to communicate with spirits. I don’t think either of us would turn any form down! Go to events, conferences, comedy nights, smoke lounges, panels, workshops and meet other women who are involved in the industry on all levels. Be curious and open-minded. Get lots of different perspectives from people throughout the industry. Learning from people with varying expertise and passions will open a world of exploration and new ways of thinking about cannabis. It’s definitely an exciting time and we are just at the tip of the iceberg when it comes to cannabis usage. It’s a great time to get involved and make your mark. Women use cannabis as much as men do and we can only build equal representation by getting involved. Also, if you’re a little nervous before meeting with people, it won’t hurt to get a little witchy and do a quick spell for self-empowerment first!